Harmony Park is an Oak Savannah and wetland in the midst of the upper Midwest agricultural landscape. Just off the Interstate highway, attendees had a 90-minute commute from the airport or train station. Many drove from the coasts and from as far south as Texas. Most all states were represented and even broke off into groups at one point to build regional communication. Contingents from Mexico, Canada, and some folks from India, Germany, and Norway attended. Michael Pilarski opened the weekend with everyone introducing themselves in a large circle by name and state. David Holmgren sent a video message for the keynote address. The large outdoor, but covered stage, provided seating for the overflow crowd and was a great place to groove and dance each night. The event tents held numerous presentations from biogas to wild foraging and food forests. The largest attendance went to the session on Women’s’ Leadership in Permaculture. Permaculture Education was the hot topic of the convergence. What, how, who was of great concern. Jude Hobbs and Wayne Weiseman represented PINA, the Permaculture Institute of North America in a discussion about teacher qualifications, content, and the regulation of PDC standards. On a similar note, Peter Bane took questions about The Permaculture Activist magazine in one session and noted the change in demographics and the language of permaculture as it affected the evolution of his publication. One participant even suggested that “activist” in the title was out-dated, bringing insightful discussion of the current times. As per usual, I missed many sessions since I am caught up with my individuals design discussions. 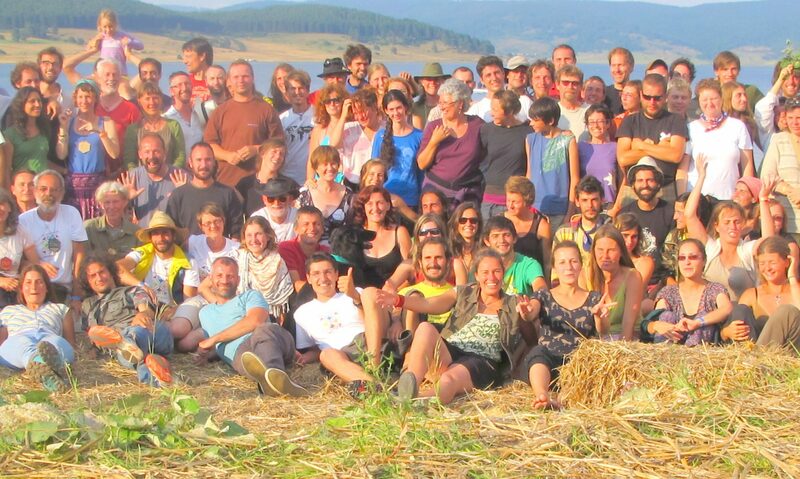 Meals are always an issue at any permaculture event. So many tastes and intolerant preferences of mind and body. This NAPC did well to accommodate the hungry crowd with a $3/plate budget. You didn’t get much on your plate at first, but you were invited to come back for seconds after all had their share of 1sts. An interesting exercise in self-regulation, as most did not return for seconds. I would have to say that the number of males in the 2nds line was inversely proportional to the men in the Women’s Leadership session. Pancakes for 400 was a challenge most cooks would refuse, but the morning went smoothly for most “on-time” diners (I thought I saw someone with eggs?). S taying in my SouthWoods Design booth the entire weekend I generally made it to the end of the “Firsties” line and also got my seconds as a matter of efficiency, being a transitional person to buffer change. Portions were reasonable, more French than American. On the lighter note, there was some reported skinny-dipping; herbal smoke in the air, and crafted brews that defied description, if not consumption. Missing at this event for me were many of the other professional designers I know. Teaching overshadowed actual practice from my perspective. For some it is one in the same. For me I would have liked to see designers Chris Shanks, Ethan Roland, Christian Shearer, Dave Bohnlien, or so many others in the field practitioners, doing the heavy design lifting. I was fortunate enough to spend time with and see a presentation by Neal Bertrando (Dry Lands, Wet/ Dry Tropics) and Nick Tittle (Fresh from 5 years working in Thailand). There is an expanding need for professional installers, site managers, and full time designers to supply the resources for the great change we espouse. From an individual education and lifestyle point of view the NAPC2014 was right on. Kudos to Monica Ibache as chief NAPC wrangler behind the scenes. Bringing a group like us together is tough. The NAPC work group did a wonderful job providing food and lodging and expanding the opportunities for participants. It was a successful gathering of minds for North America and I look forward to the next NAPC in 2016.